Sensors and electrical controls are an essential part of every industry. 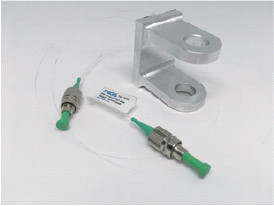 A common problem is the degradation of the exposed control elements from both corrosion and wear. Ideally, in such situations, it would be best to bury the electronics in solid metal to protect them. This isn’t possible with conventional manufacturing technologies so most companies resort to complicated seals that also degrade over time. Conventional processes such as casting and welding can occasionally create a protective structure, but these high temperature processes typically damage the exact components they are trying to protect. 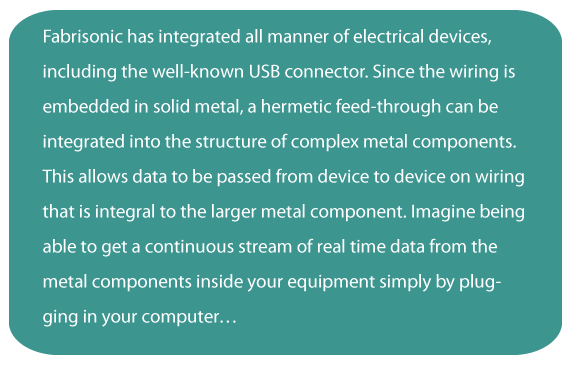 Fabrisonic’s UAM process can eliminate these common issues to create lasting protection solutions. 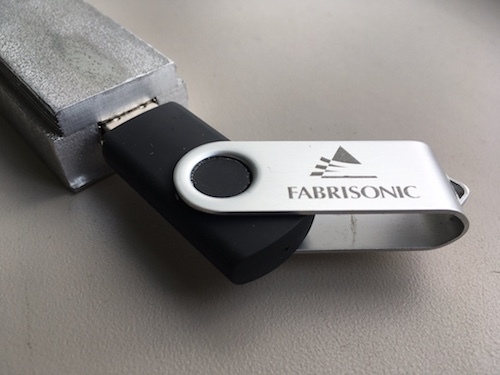 The solid-state nature of Fabrisonic’s UAM bond allows for encapsulation of all manner of wires, fibers, and sensors into a metallic substrate. Since the metals do not have to be heated for bonding, electronics can be embedded without damage. 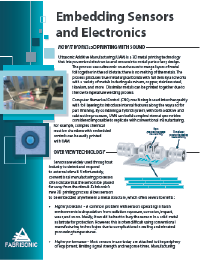 This enables sensors, communication circuits, and actuators to be embedded into fully dense metallic structures for lasting security and reliability. Chemical Reaction Vessel (pictured above) – Fabrisonic was approached to develop a means of measuring the temperature at a critical point inside a reaction vessel with complex mixing channels. By 3D printing a thermocouple at the critical mixing zone, the client could “turn the knob to 11” with great certainty that the process was still in control. The 3D printed solution increased productivity while ensuring the safety of the operation. Just because we could… Notice that a copper heat spreader was also integrally printed between the channels to increase thermal wicking for a more uniform reaction. 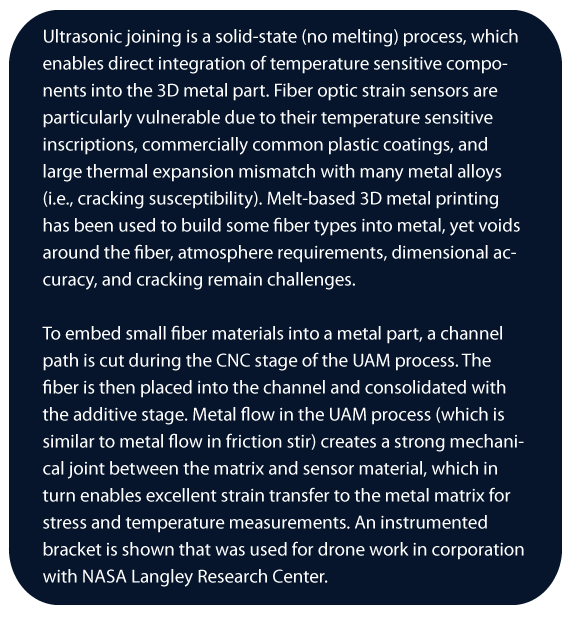 Under a NASA ‘Digital Twin’ program, Fabrisonic demonstrated the ability to embedded noninvasive fiber optic strain sensors into the brackets and struts for existing drones. The instrumented components were then used in controlled laboratory tests to directly correlate external loads to internal strain at specific locations. Applications like these allow scientists to study failure behaviors and re-engineer components for increased performance in service.